Well, bellicosis is a disease suffered by those who love war and like to see their country in one continuously. It is often fatal and has caused millions of deaths, quite often not to those with the disease, since many are quite happy to let other people fight those wars. So far, no vaccine has been successful in preventing bellicosis. 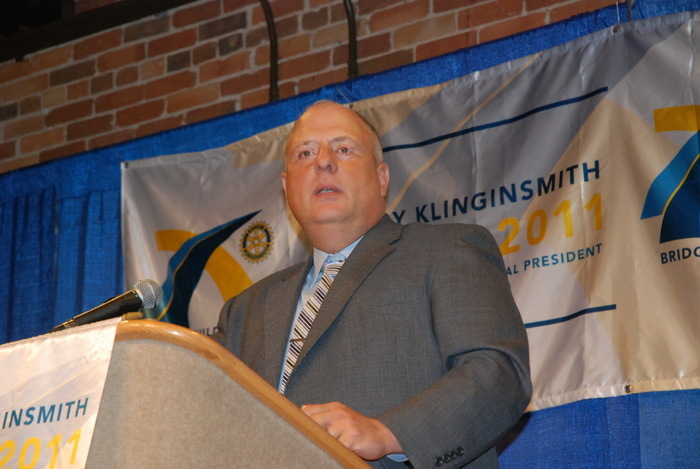 Congratulatioons to CSU for its high ranking in helping veterans. I decided to post the CSU release just the way it was sent to me. COLUMBUS, Ga. — U.S. News & World Report has listed Columbus State University among the Top 25 regional universities in the South in the magazine’s inaugural Best Colleges for Veterans rankings of 234 schools across the nation. The new rankings provide data and information on schools that offer federal benefits, including tuition and housing assistance, to veterans and active service members, all done in efforts to help veterans pursue a college education under the Post-9/11 GI Bill. CSU’s ranking reflects the relationship between Columbus State, Fort Benning and the large population of veterans who live in the area, Feret said. All of the 2014 Best Colleges for Veterans scored well in terms of graduation rate, faculty resources, reputation and other markers of academic quality. To qualify for the new rankings, the schools had to be certified for the GI Bill and participate in the Yellow Ribbon Program and Servicemembers Opportunity Colleges Consortium. In total, there were 234 ranked schools across all 10 U.S. News ranking categories: National Universities, National Liberal Arts Colleges, Regional Universities (North, South, Midwest and West) and Regional Colleges (North, South, Midwest and West). CSU recently reaffirmed its commitment to helping educate veterans when it decided to cover more than $33,000 in tuition and fees for about 50 military students who incurred costs because they registered or attended classes at Columbus State during the federal government shutdown. During any given semester, about 10 percent of Columbus State’s enrollment is military-related, whether the students are on active duty, veterans or spouses of military members. Those connections prompted the university to ramp up its efforts over the past few years to better serve the military with more online programs, academic credit for military leaders who completed the Captains Career Course, establishment of a CSU office at Fort Benning, expansion of a campus Veterans Affairs office and more. 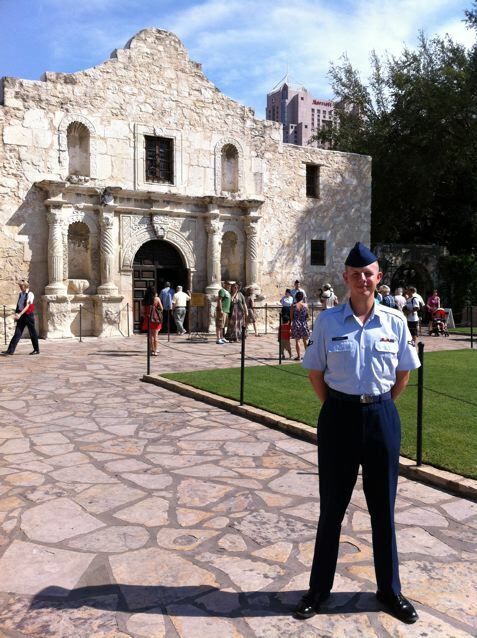 Brand new Airman Ben McMichael standing in front of the Alamo at San Antonio, TX. 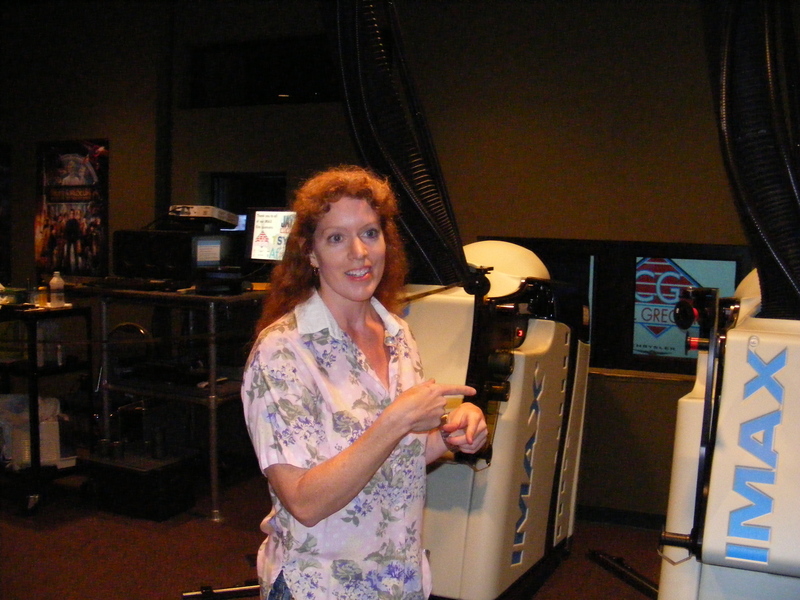 We had just left a small theater that showed a movie about the history of the Alamo. During the introduction the volunteer docent looked at Ben and thanked him for his service to his country which caused everyone in the audience to applaud. Then, on the way to the van a man walked up to Ben, shook his hand, and thanked him for his service. It is always moving to see families coming from all over the United States to see their progeny graduating from basic training at Fort Benning. Not just the ceremonies, but in the restaurants and shopping malls around Columbus. 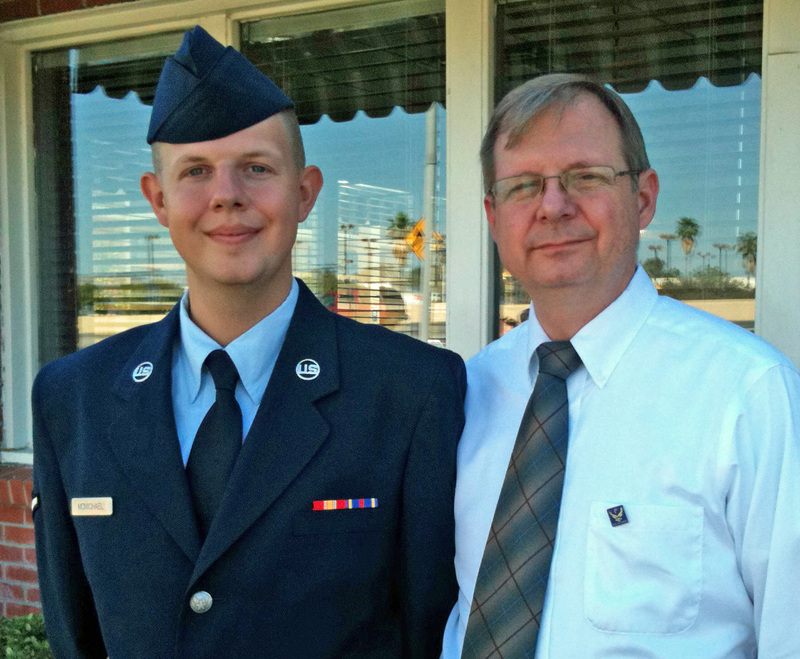 I got a taste of what it means to those families and their military service members last weekend when I went to San Antonio, TX to see my grandson Ben graduate from U.S. Air Force basic training at Lackland Air Force Base. I was there with my son Rick, daughter-in-law Marian, grandson Christopher and his wife Kristen. 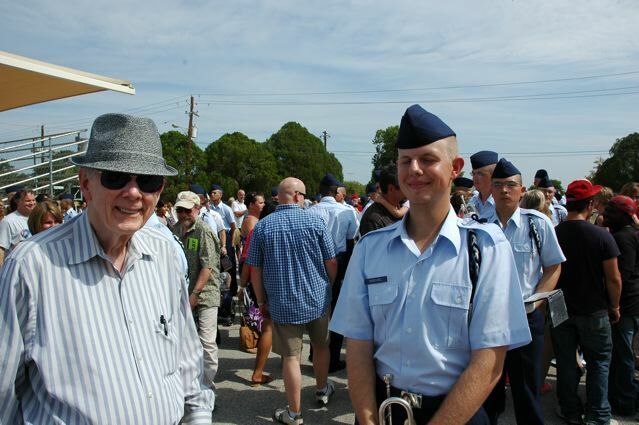 Not only did Ben go through the basic training course, but on top of that, he played first trumpet in the 323rd Training Squadron Drum and Bugle Corps. 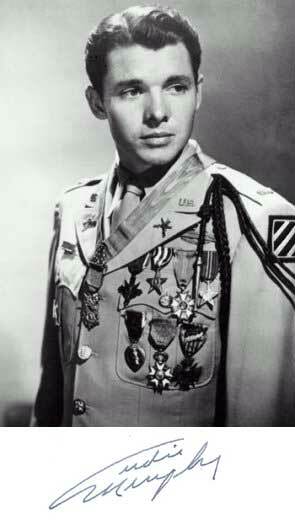 When he introduced me to the lt. colonel commanding the 323rd, he told him, “That’s my granddad. 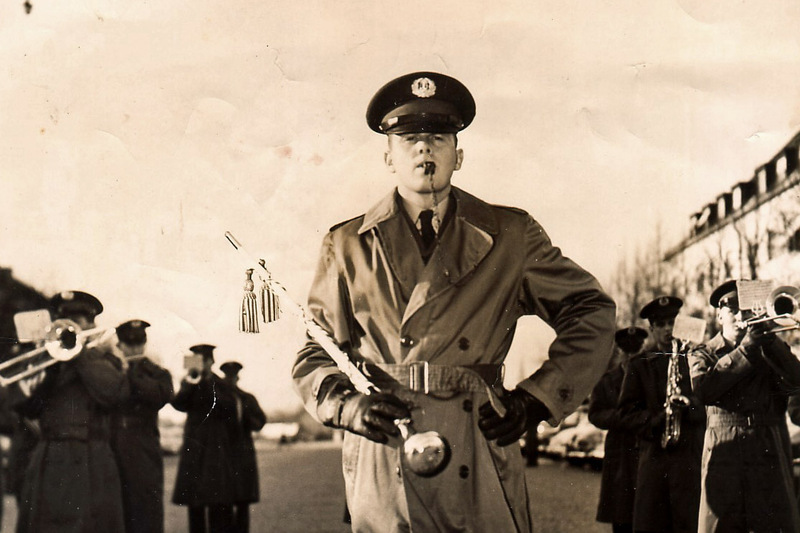 He was a drum major of an Army Band.” The colonel said, “Well, this must be really special for you, even if he only did it for 8 weeks.” Indeed it was. I was a full-time bandsman, but, even if he was only in an Air Force band for 8 weeks, we can both say we were in American military bands. Ben is now at Sheppard Air Force Base at Wichita Falls, TX, where he is in training to be an ordnance supply and maintenance technician. The 323rd Training Squadron Drum and Bugle Corps marching and playing for the 323rd graduation ceremony, Lackland U.S. Air Force Base, San Antonio, TX..
For someone who was a young boy during World War II, the graduation ceremony was quite impressive. Surrounding the graduation pareade grounds were the great fighters and bombers of that time. Among those historic war birds was a P-51 “Mustang” – Ben’s training squadron is called the Mustangs, and there is a mural of a Mustang on his barrack’s wall – and there was a P-38 fighter, and a B-29 bomber, a B-17 “Flying Fortress,” a B-24 “Liberator,” and the transport work horse of World War II, the C-47. 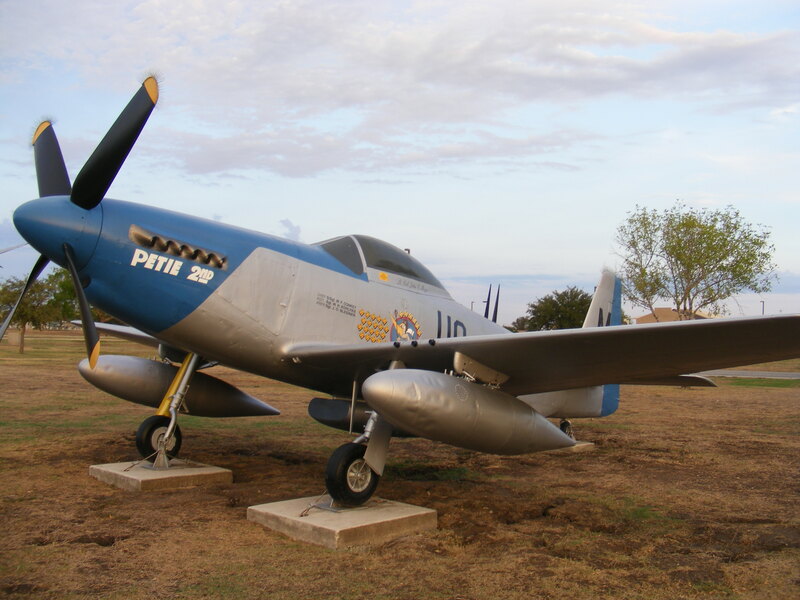 P-51 "Mustang" World War II fighter. You take all of that, add the 323rd Drum and Bugle Corps playing “The Air Force Anthem,” you know, the one that starts with “Off we go into the wild blue yonder,” and “America the Beautiful,” an Air Force general welcoming the new Airmen into the “most powerful air force in history,” and the 600 graduates and their instructors passing in review, and you get a lot of cheering in the stands from moms and dads, sisters and brothers, granddads and grandmothers, and even aunts and uncles. (I met a lady from California who had come to see her nephew graduate.) You also get a lot of moist eyes, including mine. Me and Ben following the 323rd Training Squadron Retreat and Coin Ceremony. Even though family were allowed to come over and talk with the graduating airmen, the drum and bugle corps members had to stay in formation. Why? Don't ask me. 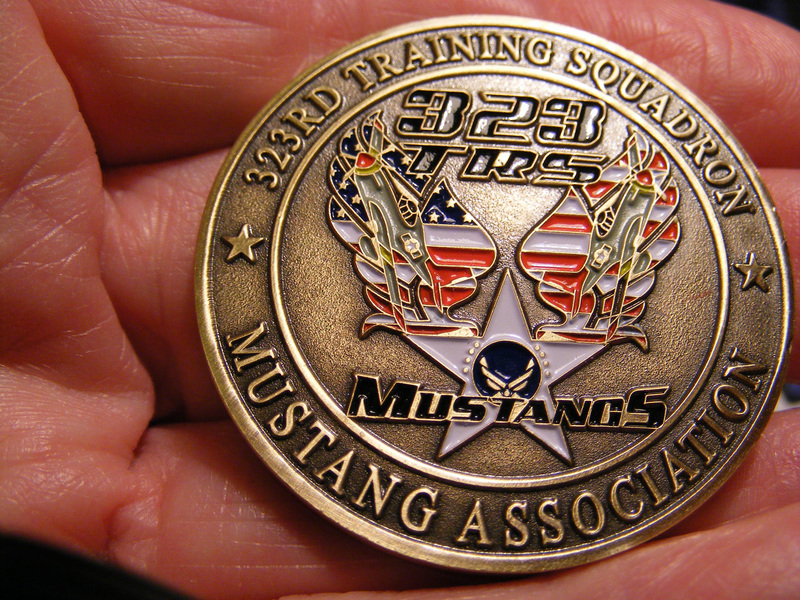 After the Retreat and Coin ceremony was over, we went to a base store where Ben bought a coin just like the one he was given by the Mustang association, put it in the palm of his hand, and shook hands with me leaving the coin in my hand. It's the most valuable coin I will ever have. Ben and his proud dad, my son Rick. My Army band memories came flooding back yesterday afternoon as we sat in the mezzanine of the Bill Heard Theater. 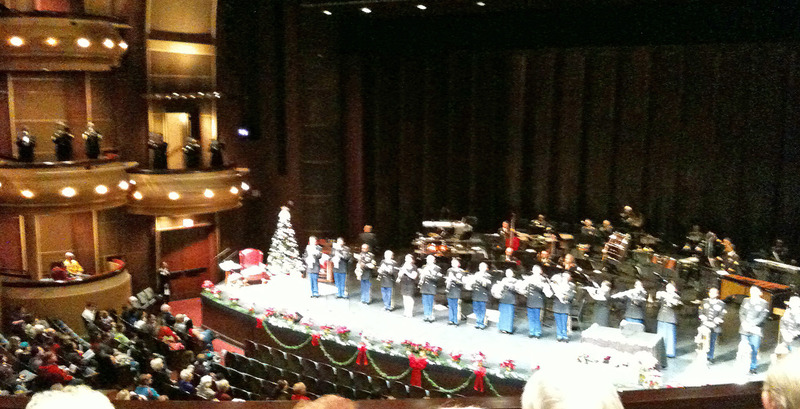 The Fort Benning band, now called the Maneuver Center of Excellence Band, was delighting an almost-full house with its annual Christmas concert, “Ringing in the Holidays!” ( Bill Heard is a 2,000-seat theater.) The band also packed them in again for the evening performance. It got a long, standing ovation at the end of the concert, and, I am sure it was not just because Columbus is an Army town, one that continually shows its appreciation for the Fort Benning troops, but because it was an excellent concert. The 30th Army Band, the one in which I was a percussionist and drum major in 1954-55, no longer exists, and a Google search produced no history of it. It was located at McGraw Kaserne, Munich, Germany, which was headquarters for the U.S. Army in southern Germany. We also played some concerts for civilians, but our main function was to play for review parades, not only at McGraw Kasern, but for Army posts all over southern Bavaria. Every week we would board a bus and travel to other kaserns and posts. The views could be spectacular as the bus would wend its way to some remote posts high in the Alps.